This week I have posted a photo from my trip of a lifetime back in 2010 when I turned 50! Sadly that seems a long time ago now just four years on! Nevertheless its less about that than being in Rome. Rome was quite hot when we were there, it was summer of course but I think it was exceptional. Unfortunately the apartment we selected for our time there near the Campo De Fiori didn’t have air conditioning… again that’s another story! Whilst there of course there were so many things to see and be amazed by, but one of these things was the Pantheon with its dome and central opening to the sky. It was commissioned during the rule of Augustus (27 BC – 14 AD) and rebuilt by Emperor Hadrian in about 126 AD, its THAT old. When you think of the tools of the day and the know how involved to create a dome with strength is mind blowing!! 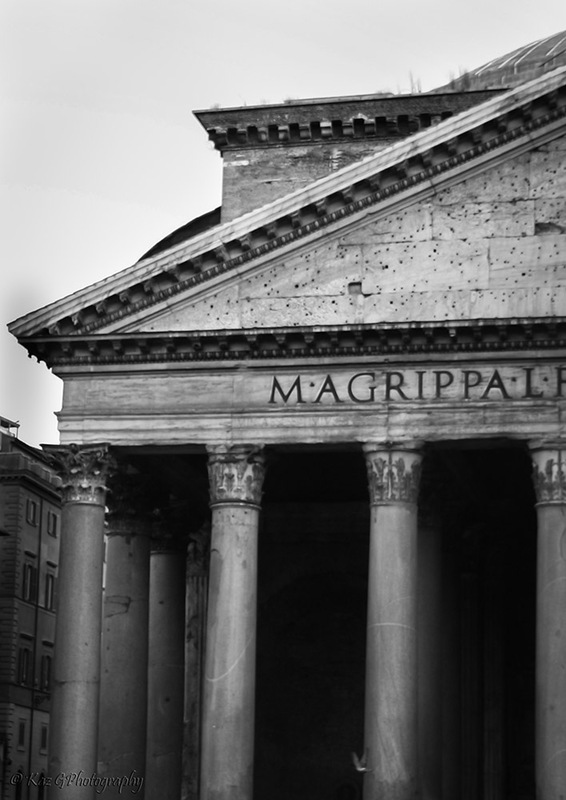 It is located in the Piazza della Rotonda and is one of the best preserved of the ancient buildings. I took this photo of a part of the dome as I didn’t have a wide angle lens at the time and was highlighting where the light was shining down into the dome itself. For some reason I didn’t take a full picture of the Pantheon from the outside. I think it might have been my dislike of crowds that ruin any good photo 🙂 and decided not to take anything that had about 100 heads in it. I did find a half pantheon, why I took this only I don’t know but here it is as well for atmosphere 🙂 . For more monochrome madness black and white photos from some very talented people please go to the link here. MM is run by Leanne Cole and Laura Macky and happens every Wednesday. Go to Leanne’s blog for more information. 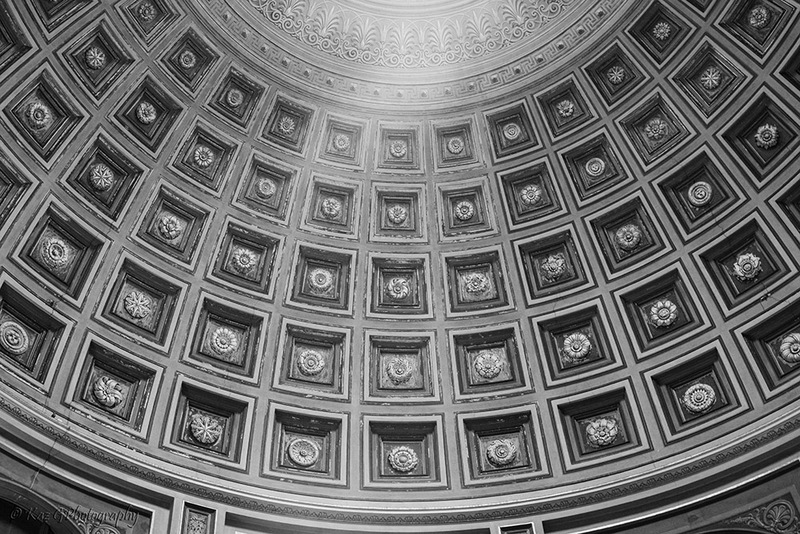 the Pantheon is a beautiful contribution to the monochrome madness! Glorious place via your lens, Kaz! Sounds like you did have a wonderful time – thanks for the info too. So interesting! The engineering feats were incredible! How they did it is still an enigma to me and when it rains who cleans the floor 😉 . Thanks for your nice comments. I loved yours too! I visited the Pantheon earlier this year and was blown away by it’s beauty and perfection. I took a number of photos but didn’t even think about using B&W. This combined with your use of the light has resulted in a great photo. You’ve inspired me to think about using B&W more often in the future.